QUALITY GUARANTEED – Rest assured that we use the highest quality ingredients and our products go through stringent third party testing. As always, our products are backed by our 100% Money Back Guarantee. We are confident that you will love our high quality and well thought out formula. However, if you are dissatisfied with our complex you have 30 days to return it for a full refund. An optimal growth of your muscles and tissues is impossible if you do not pay the right amount of attention to the recovery of your body. You will need both essential and non-essential amino acids that will enable a full recovery, in order to prepare well for your next work-out. 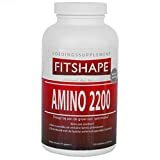 Fitshape Amino 2200 consists of a blend of top notch ingredients, including supplements that are specifically developed to help both athletes and non-athletes shape their bodies the right way. It also contains all essential amino acids (often described as the building blocks of the human body) and so-called BCAA’s, to help you build fat free muscles and a great resilience. Amino 2200 is available in a free form as well as tablets. The use of Fitshape Amino 2200 will make you sure you recover the right way before starting your next training session. Ingredients Calcium casein, soy protein isolate, fatty acids (anti-caking agent), hydroxypropyl methylcellulose (coating), whey protein, magnesium salts of fatty acids (anti-caking agent), cross-linked sodium, carboxymethyl (binder) and carnauba wax (rinse aid). Recommended amount: six tablets spread over the day, to be taken alongside meals or immediately after the workout. Take them with lots of water of fruit juice. Fitshape Amino 2200 is available in both packages of 150 and 325 tablets. Posts related to FITSHAPE AMINO 2200 – #1 BCAA Branced Chain Aminio Acids Supplements – Gains Muscle mass - Burns Fat and fast recovery.